This 2009-2010 Mars map is a collage of sketches made through my telescope (SCT 200mm, and colour filters) which spanned from October 2009 till May 2010. Mars offers the best telescopic views at opposition. 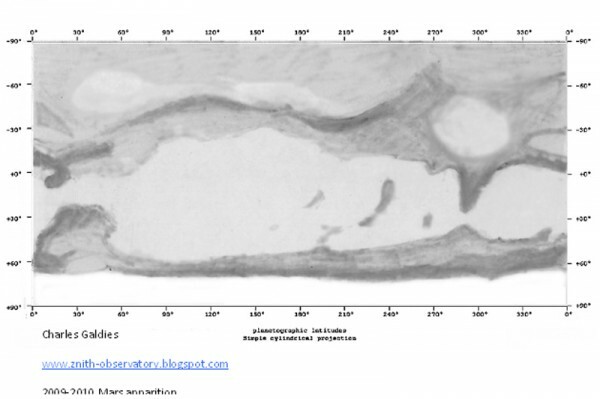 Large surface markings offer interesting analysis and comparison with similar maps produced by astro-imagers using camears instead of their eyes. As often seen through an astronomical telescope eyepiece, the planet’s orientation is inverted, with Mars’ north polar cap at the bottom. For a full detailed 2009-2010 Mars Apparition report, including visual observations and sketches made, I invite readers to CLICK HERE. Excellent sketch and beautiful done web blog.